Click here for the latest version of the Phase 1 summary report which is intended at this point for information and comment by collaborators and others who have indicated their interest in following the Penang New Mobility project. The summary quickly reviews the initial organization and plan for the project, and progress in the second half of 2013. It also sets out the basis of the planned 2014 implementation stage. Over the second half of 2013 a highly innovative collaborative project was initiated in Penang with the aim of creating a new model for sustainable transport policy and practice. New approaches are badly needed because every day more cars are pouring onto the road network creating fast-growing congestion and all of the well-known problems that are associated with uncontrolled automobilization. At the same time the needs of a significant portion of the population’s needs are not being fairly met. This is a familiar scenario in cities across the Asian region, and it is widely accepted by government and the public that new approaches are needed. But how exactly to do this? Penang has set out to show the way over the period 2013-2015. The Penang New Mobility approach combines top-down (vision, strategy and policy) with bottom-up (defined needs, projects and implementation). The 2013 project took as its aim the challenge of providing more and better mobility choices for the people of Penang in their daily lives. Not roads, not bridges, not motor vehicles, not technology — but serving the needs of the women, men and children of all social and economic classes in all corners of this very diversified state. The program was hosted by Think City and numerous local partners, in cooperation with EcoPlan International. It was jointly led by Prof. Eric Britton, a recognized international authority in the field of sustainable transport and Dato’ Dr. Anwar Fazal, Chair of Think City. After two months of preparatory work, a three-week civil society Peer Dialogue was launched on September 20th opening a program of presentations, symposia, master classes, workshops and supporting public events, all with the goal of creating a stronger base of local support in favor of a more sustainable transport system to better serve the people of George Town and Penang. A wide range of local and state organizations participated, and eventually came up with and discussed close to one hundred ideas for new services and approaches that are consistent with a sustainable transport system. The first pillar of the project was to reach out to learn from and adapt the experience of successful innovations around the world in order to create a coherent strategic base for identifying and implementing transport reforms and investments over the course of the period 2014/15. Such a unified strategic approach is essential if we are to avoid ad hoc, inconsistent and possibly counterproductive decision-making and investments that can lock in a system for a long time. Then, against this consistent strategic base the second major task was to get together to identify, prepare and put in motion a first set of relatively low cost projects and approaches that have proven themselves in leading cities elsewhere. The goal is to find projects which have strong local backing and can be initiated and carried out over the course of 2014. And beyond that we are looking for “learning systems”, projects which are useful in themselves and at the same time show the way in which diverse partners can be brought together into the problem-solving process. A draft report now available presents these findings, and is being distributed to the key participants in Phase 1 for their information and comment. At the same time, the first series of specific project ideas identified in the collaborative brainstorming process are already under active discussion and consideration, and it is expected that as the report becomes more widely known and new partners come in additional project initiatives will begin to form up. That is the plan. The following listing while not complete will give the reader a first idea of the coverage of the contact efforts and the organizations invited to share their ideas and perceptions with the team. At a time when public policy in the sector needs new ideas and new approaches, the 2013 project has attempted to scan potentially appropriate practices worldwide in order to draw them to the attention to all of those concerned with these issues in Penang. The report is thus not a how-to-do manual but rather an encouragement and stimulus for no less than Rethinking Penang. And that is much needed. The underlying reality on the streets and public spaces today is this: Penang’s transport, mobility and public space arrangements leave a great deal to be desired. The grinding situation is one of every day: more cars, more traffic, more congestion, more pollution, more lost time, more anger, more noise, more isolation, more accidents, and fewer good affordable options for getting around for the majority of the population. The system is in many ways inefficient, and worse it is costly and unjust. But there is worse yet: year after year they are continuing to deteriorate steadily, almost visibly. The citizens and taxpayers of Penang deserve better. One bit of good news is that there is virtually nothing that is particularly original about the circumstances of inattention, inconsistency and decay; these are the same behaviors, patterns and conditions encountered in the vast majority of all larger cities across the developing world. Perhaps surprisingly this can be seen as good news. Because we thus know what the problems are and we know how to resolve them. There are very few unknowns. Many other cities and regions have faced these challenges in the past and have figured out how to make this transition. So there is no reason why the same cannot be done in Penang. And one day it will. The only question is when? There are some critical reasons why Penang needs to turn the situation around without delay. In the 21st century cities compete – and any city which does not offer a pleasant and efficient place to live and work is going to lose out in the international competitions. The best and brightest young people will leave such a place and it cannot expect to compete for new investments, jobs and the creativity of the brightest and best in the international arena. Quality of life counts! 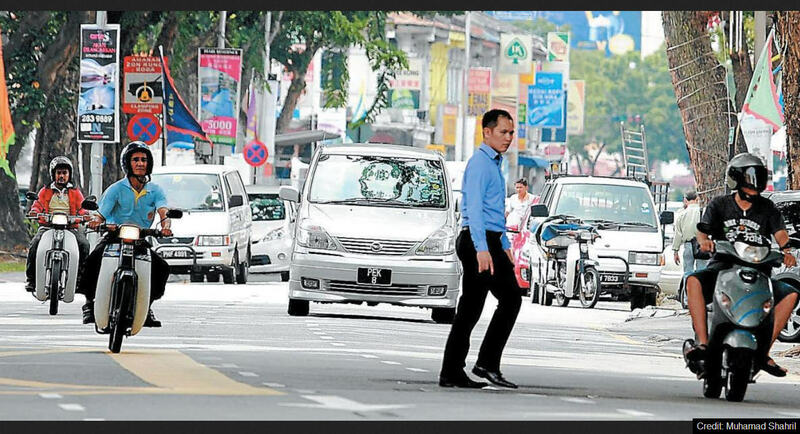 So for all these reasons it is time for those in charge of transport policy and practice in Penang to look hard at what can be done to make it not only a great place to live and work but also a vigorous competitor for the best. Fortunately Penang has a number of real advantages, potential and eventual tools and measures that can now be put to work for this reconversion effort. The good news is that Penang has in hand virtually everything needed in order to prepare, initiate and advance a major sustainable transport reform. The money, the technical capacities, the institutional framework, the autonomy, and the ideas and examples needed to make major improvements, many at very low cost and well within the 2015 time horizon of the Strategic Transport Master Plan. The Master Plan identifies a number of institutional and technical reforms needed to improve the performance of all aspects of transport in the state efficiency, environment, economy, resources, energy, and quality of life for all. It provides a solid point of departure. You have in place a solid institutional structure, led by the State, supported by the Penang Transport Council, with at the core the dynamic Municipal Councils on the island (MPPP) and the mainland (MPSP). All of which supported by one of the most well developed networks of civil society and public interest groups in all of Asia. These are huge assets for your transformational program. And it is not a matter of money. You have sufficient funds under your control to make virtually all of the improvements which are necessary over the course of the next two years, if you concentrate above all on the management of the transportation assets you already have — as opposed to as in the past spending heavily on new construction projects to solve your problems. The priority is not to further expand supply of inefficiently used infrastructure, but rather to manage and use it better. The Transport Master Plan provides a number of useful guidelines for how to do this. With the collaboration of my colleagues at Think City and all those who have so generously given of their time and ideas over these last weeks, and particularly all those participating in the Focus Groups, we have come up with an initial brainstorming list of specific project initiatives which can be done quickly, and which are entirely under the control of state and local governments. As author I very much hope you will look at them, and in time through your suggestions and recommendations help us to expand and improve this open resource inventory. And if we look around the globe we will see that Penang is by no means alone with these challenges. So too, and not all that many years ago, were many of the leading cities that today are showing the way. Most of them not all that many years ago were themselves victims of inconsistent, unthought-out and inefficient transportation policies themselves. The lesson is that you do not wake up in the morning and find yourself suddenly having become a “leading city “in this respect. You have to roll up your sleeves and get to work with an entirely different set of values and goals. The key to the success of this project will be in the follow-up in the year ahead. What you see here is but a first cut of ideas and projects. But it will be in the follow-up, the adoption of these ideas by local groups and agencies who can turn them into reality that will make the difference. In closing I can tell you one thing for sure. And that is that Penang will one day make all the necessary reforms that today are so badly needed. You will get to it, sooner or later, because that is what the world trend is. That’s what successful cities do. So it is really a question of time. If you have the vision, the strategy, the energy and the leadership you can advance the agenda by a decade in just the next year or two of careful applied work. That will be your choice — no one can do it but you. Moving from old to “new mobility” is a major and most challenging step. It is a area of public policy and private practice that involves making a major break between an earlier generation of values, tools and strategies (namely the dominant 20th-century pattern which centered around above all cars and infrastructure) to an entirely new way of looking at and dealing with these matters which are so important to us all in our day-to-day lives. Perhaps the defining quality of the new mobility approach is that it treats all of the many and varied details of transport and urban space as a system, a complex interactive system. In such systems it is understood that all components have significant repercussions in other areas. This effectively rules out inconsistent ad hoc decision-making, one of the major banes of policymaking in many parts of the world in the past. Strategy 23. But above all . . . PICK WINNERS! The key implementing agencies of the program are the State Government and the two Municipal Councils – MPPP and MPSP — coordinated with the Penang Transport Council. The project is followed and accompanied by Think City and supported by the International Advisory Network of EcoPlan and World Streets. The key lies in the active engagement of Civil Society Partners in Penang (NGOs, universities, researchers and consultants, media, bloggers, local associations). Internal Reviews: . . . of the Interim Report and comments from all of the organizations and individuals involved in this collaborative brainstorming process over the last months. 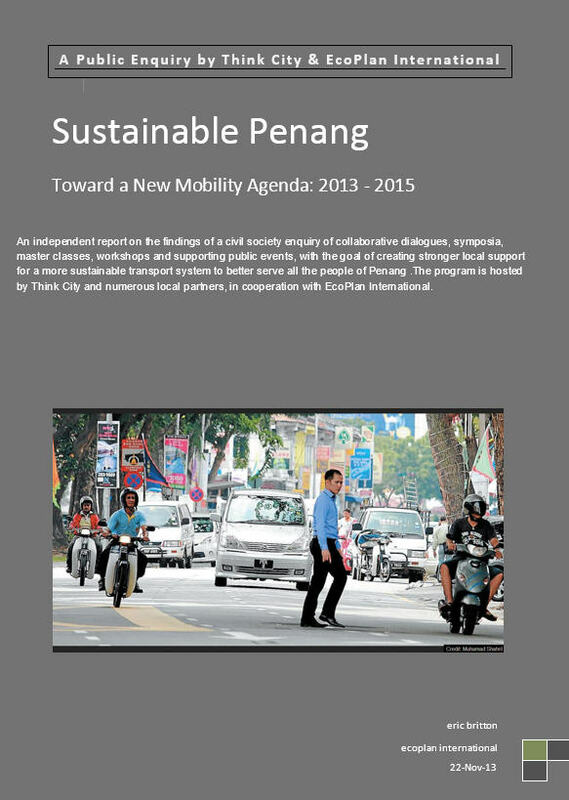 Blog: Sustainable Penang/New Mobility at http://sustainablepenang.wordpress.com. This entry was posted in 2014, Organization, Phase 1, Phase 2, Work program. Bookmark the permalink.